Join us for an energetic presentation of increasing rigor in the English and social studies gifted classrooms. We will share ideas for impacting instructional paradigms, restructuring the classroom, and changing assessments. In addition, we will share specific delivery strategies and address concerns such as time management and pacing. Gifted children gain confidence when they are the first to share the “one right answer,” but they thrive when they think beyond the "book answer." Curriculum that challenges students to stretch their thinking begins with innovative design, but is also accomplished with inventive uses of published resources and interactive units. In this session you will learn about proven strategies and activities that can be used immediately in the gifted classroom to teach students to think critically and creatively. Kid Tested, Kid Approved is a session about an Enrichment Cluster I created due to the students interest surveys from our school. The students from other grades come to my classroom once a week for 75 minutes. We test different foods, products, games, etc. to see if they are really as good as they say they are! The kids conduct blind taste tests and write down their results. So, come join us an learn about all of the fun things the students have discovered through this exciting cluster experience! What is an Ngram Viewer? A discussion of the role of technology in enriching student learning and assessment. Innovations in gifted education often permeate and positively influence general education, some notable examples include our disciplines’ emphasis on creativity, student choice, differentiation, and emotional development. Technology is an area where there is still significant opportunity to innovate. Tools like Google’s Ngram Viewer, GoNoodle, Kahoot, and Flubaroo will be discussed in addition to technology that participants share. This roundtable discussion will focus on technology resources available that could be used in the classroom to enrich student learning and assessment practices. The construct of psychological capital (psycap) is comprised of hope, optimism, resilience, and confidence. 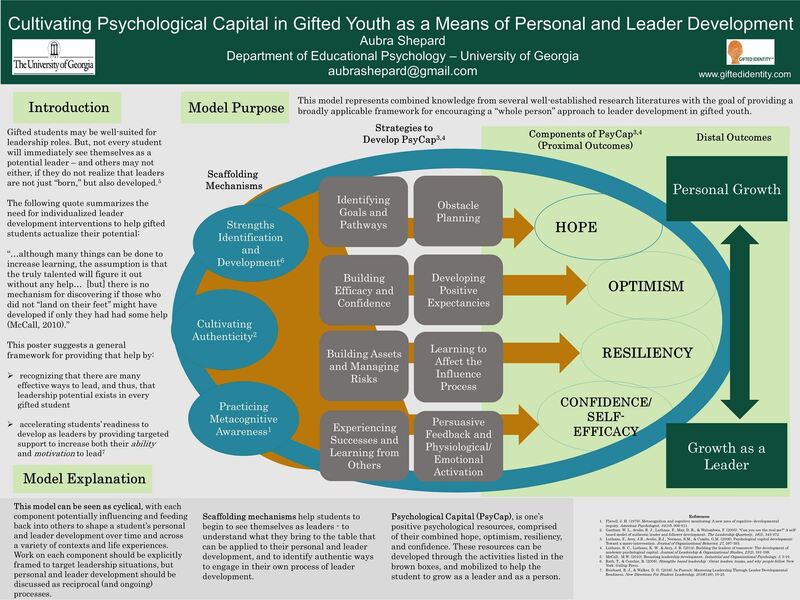 This presentation will review the utility of helping gifted youth to develop psycap in their personal lives, as well as the benefits of psycap in leadership endeavors. You will learn about research related to the components of psycap, and how it can be cultivated. This discussion will also outline how metacognition, self-awareness, and a strengths-focus can aid in the development of psycap. Because problem solving can be difficult - even for gifted students - it is important for each student to have a "tool-belt" of problem solving strategies. Many of the strategies presented in this session will force students to change their normal thinking patterns and approach each problem in a different way. You will leave this session with many unique problem-solving techniques that will help all students be more successful in math contests and on tests - including SAT and ACT tests. Each participant will leave the session with 10 problems that they can take back and implement immediately in their classroom that will interest and challenge their gifted students. In this session, the University-School Partnerships for Achievement, Rigor, and Creativity (Project U-SPARC) research team will share findings and introduce collaborative initiatives that support Clarke County’s school improvement equity goals for its gifted education program. Little data exists to explain the nature of the gifted eligibility problem or improvements that create barriers and bridges for under-represented groups to gain access to gifted and advanced programs. In partnership with Clarke County, Project U-SPARC’s research team replicated the VanTassel-Baska, Feng and de Brux’s (2007) gifted eligibility research that conducts a trend analysis of eligibility profiles of students who qualified for gifted programs and those who did not, as well as identifies childrn from under-represented groups for gifted programs. U-SPARC researchers also have generated recommendations associated with CCSD’s goal to design opportunities to promote creativity. Total School Cluster Grouping (TSCG) is an effective, research-based programming model for use in elementary schools. By focusing on differentiation and flexible grouping, it provides full-time services to gifted students and benefits all students and teachers in the school. Research on TSCG has shown that student achievement increases, teachers widely implement gifted education strategies with all students, more students are identified as high-achieving, and fewer students are identified as low-achieving (including students from economically disadvantaged families and diverse cultural and linguistic backgrounds). Participants will learn why and how to successfully implement TSCG and leave with site-specific tools to increase the achievement and motivation of all learners, while providing the academic challenge and individual responsiveness essential to gifted learners. This session will address how to flip your classroom with minimal materials while including advanced content for gifted and high achieving learners. Included will be ways to stretch technology, applying for grants, suggested websites, and gaining support from faculty, staff, and parents. Learn from fellow educators who have just survived a drastic, fulfilling change in current classrooms at a low income school. Chicopee Woods Elementary School a Title 1 school with 90 plus percent English Language Learners, has implemented unique and exciting programs to engage its learners. Many programs are aimed at increasing exposure and building context for students. Using gifted pedagogy, Chicopee Woods Elementary strives to discover the gifts of our high achieving learners while building schema which will allow them to discover those gifts within themselves. Join us as we take you on our school's journey. Join us in an exploration of personalized learning, student driven projects, and the “how to” in creating wonder through learning in the gifted classroom. We will share ideas, lessons, projects, and technology based applications for you to innovate, create, and accelerate learning! Problem Based Learning is an elegant way for teachers to lead gifted students through a personalized investigation process of learning. PBL also helps teachers differentiate for characteristics of giftedness, include core content curriculum, and work with authentic problems in an environment that encourages independence, professional and innovative products, and traits associated with expert problem solvers. Participants will review the components of PBL, see and share examples, and practice writing a problem of their own, as time allows. Perfectionism, often described as a multidimensional construct, is a commonly associated characteristic of gifted individuals. Perfectionism has been considered a vehicle for individuals to exceed expectations and rigid guidelines; however, perfectionism has also been linked to various types of maladaptive behaviors such as anxiety, depression, and stress. In this presentation, the author focuses on ways perfectionism can be psychologically distressing to gifted and high-ability Black women in postsecondary education when compounded with stereotype threat. Based on the review of literature, this courageous conversation plans to explore the possible implications of these maladaptive behaviors for Black women pursuing and completing postsecondary degrees. The facilitator also explores how these implications affect creativity, achievement, and motivation. Lastly, the facilitator and panelists will explore and offer recommendations to support gifted and high-ability Black women combating perfectionism and stereotype threat. Who are gifted teachers, what distinguishes these individuals from their peers, how do they reach their students, and what can we learn from them? Research suggests that teacher enthusiasm, feedback, and content knowledge positively affect student motivation, learning, and engagement. Research also reveals the importance of positive and supportive student/teacher relationships. In our work concerning student attitudes toward school, a handful of teachers (n=20) emerged, in the eyes of the students, as exemplary. Follow-up study provided insights concerning how and why these teachers differ. What and how they teach and the ways they relate to individual gifted students distinguish them from their colleagues (n>400). In this session I discuss the quantitative and qualitative findings that provide insight into these gifted teachers. I also highlight implications for professional development and classroom practices based on the findings. How do you engage teachers and students in grades 3 - 12 with authentic projects and a real audience? With a Technology Fair of COURSE! Your teachers have standards based projects ready for the technology fair - from Game Design to Websites, Power Points to Robotics, and Excel to 3D Design. You will leave with all of the documents needed to have a school or regional technology fair and have your students go on to compete at the state level - for NO COST - really! Enhance your student's ability to think more critically and creatively with practical differentiation strategies you can immediately take into the classroom. Attendees will leave with a working knowledge of implementing DOK and HOTS questioning strategies into their class or content area as a part of their differentiation practice tool box. Attendees will also walk away with at least three activities they can implement in their classrooms with ease. Session participants will learn how to engage gifted learners using creative object-driven logic riddles that are designed to promote critical thinking and problem solving. We will provide strategies that participants can use to differentiate instruction to accommodate all students, not just gifted learners. Participants will explore opportunities to expand existing student's prior knowledge and to generate new knowledge and develop skills in the areas basic to gifted education: Communication Skills, Creative Thinking Skills, Group Dynamics, Problem Solving/Critical Thinking, and Research skills. Join us to see and hear how one metro district in Georgia used the Global Cardboard Challenge as a springboard for cultivating creativity throughout local communities in the area. The impact and effects of the challenge went beyond our expectations and started local revolutions in thinking. Real-World Innovative Investigations: Differentiated PBL That’s Fun! independent projects that inspire creativity and growth. Learn to provide clear student guidance that differentiates in every aspect with structured checkpoints and comprehensive assessments. This teacher presentation will demonstrate the creation and management of successful interdisciplinary projects that incorporate choice within a structure and allow teacher facilitation. Motivate your students year-round while alleviating your workload! View student portfolios, exhibits and photos. Excellent detailed handouts. Leave refreshed with new methods to implement right away. The PBL Project - We're not preparing students for Jeopardy anymore! FREE BOOKS! Attendees to this session will receive free books that feature integrated problem-based scenarios. Problem-Based Learning promotes communication, collaboration, and problem-solving skills… all of which are crucial skills in the 21st century. Participants in this session will be introduced to the philosophy of Problem-Based Learning and the PBL Project website (www.pblproject.com). During the presentation, we will review the layout and content of the PBL Project books so that teachers can implement the exercises successfully during classroom instruction. Attendees will learn innovative ways to encourage deductive reasoning and critical thinking in the classroom through the use of mysteries. We will explore how to use mysteries of literature, math, and science to encourage investigative skills and problem solving. Presenters will provide ideas, outlines, and lesson plans, along with lists of resources that can be purchased if desired. Locally and nationally, culturally and linguistically different or low-income students are underrepresented in gifted programs. Teachers in two elementary schools in Clarke County worked with the UGA’s Gifted and Creative Education faculty to use Frasier’s Traits, Aptitudes and Behaviors (TABs) Observation Tool to help identify students for referral and to develop Students of Promise programs (bridge programs). This session is an overview of professional development experiences, how the TABs tool was used to develop the Students of Promise programs and the benefits of the University-School Partnerships for Achievement, Rigor, and Achievement (U-SPARC) collaborative experience. Come experience math, higher-order thinking skills, and fun in this hands-on math workshop utilizing award-winning math board games in the Muggins Math Series developed by two former Georgia teachers. Games teach math visually and conceptually without an emphasis on speed as players compete in these challenging, multi-leveled games for skill levels of age 5 to Einstein! Prize drawing for Muggins/Knock-Out game at end of session. Learn about important updates regarding our most recent forms Iowa E and CogAT 7! Tara Mathis, HMH Account Executive, will review the latest updates which launched in 2016! This session is for both current users of Iowa or CogAT, or for those looking to update to newer forms & norms. This beneficial information will help you move forward in your assessment of gifted and non-gifted students and stay within the current state guidelines. Local Chapter representatives and those interested in starting a Local Chapter are cordially invited to join the Local Chapter Chair, and other Local Chapter leaders for this opportunity to swap ideas, discuss concerns, and share tips, tools, and techniques for starting and/or sustaining enthusiasm and support for your Local Gifted Program and Association Chapter. The Advanced Scholars Academy (ASA) at Riverbend Elementary is an innovative program which promotes inquiry, creativity, critical thinking, and problem solving. ASA is a program of choice for self-motivated and passionate learners who are seeking rigor and acceleration within a challenging curriculum. In this session, participants will be given an overview of the development of the ASA program, founded 5 years ago. Presenters will share success stories and challenges involved in the implementation of this advanced program. Visit this session to learn how to utilize research-based strategies designed to engage learners in critical and creative thinking via current events. Teacher and student work examples galore will be shared to help teachers decide which types of lessons would be a great fit for their programs. The presentation will focus on effective instructional strategies that can make student use of technology beneficial to student learning and success. The presentation will also discuss the instructional benefits of using LMS (learning management systems) such as Google Classrooms and Edmodo as online databases and management for student learning. Researching the Weird: Are Zombies Real? This unit is designed for 8th grade ELA students, but can also be used in science and social studies! My presentation will take the audience through an interactive, technologically savvy unit in Researching the Weird in an ELA classroom. We use science, history, and the study of pop culture to write a research-based argument about the possibility of zombies in today’s world. The unit includes neat technology, opportunities for debate, a Socratic Seminar, and many other freakishly cool activities. You’ve heard of the “Torrance Tests”, but what are they exactly? How are they used? What are the practical applications for their use in schools? Well here’s your opportunity to find out more about the Torrance Tests of Creative Thinking (TTCT’s) and how to use them in your classroom. This workshop is purposed to introduce teachers, administrators, and parents to the underlying constructs of the TTCT’s and strategies for creating an optimal atmosphere to foster creative thinking in your classroom. Ignite the passion, fire, and innovation in your students. I believe in "playing to learn". This session will show you how to inject fun into lessons that students don't typically enjoy. Not only will your lessons be fun, they will also require the students to be innovative and creative while solving different types problems. *This session is NOT for you to come listen to me. My focus is to let you see how easy it is to include "play time" into your lessons. The flipped classroom is a pedagogical method in which the typical “teaching” and “homework” elements are reversed. Kate will share with you how flipping her middle school math classroom was an effective method for differentiating for all learners, including her gifted students. Come and discover how to flip your own lesson, unit, or subject. Session will include strategies, tips, and suggestions of free/inexpensive resources to get you started. Open to all subjects and grade levels. Are you frustrated by your academically gifted students who seem to be uninterested and unmotivated? Participants will gain an understanding of factors that often lead to underachievement and discover strategies that foster intrinsic attributes of success and decrease underachievement. Issues that specifically face gifted students at all socio-economic levels, Rimm’s Trifocal Method, and practical strategies for teachers to use to improve achievement and potential in their gifted students will be highlighted. Service learning, a teaching method which combines learning with service to others, can provide a conduit for empathetic gifted students. Implementing a service learning framework nurtures empathy, allows for student voice and choice in learning, and promotes the 4Cs: critical thinking, communication, collaboration, and creativity. Students use problem-solving skills in their practice as social innovators and activists. Come be inspired by a classroom that has transformed into a passionate, caring culture of kids solving real-world problems through service learning pedagogy. Want to increase student engagement and uncover your students’ passions? Then Genius Hour is for you! Learn to leverage technology to transform learning through Genius Hour Projects. Just an hour per week leads to projects incorporating many standards in Language Arts, Research, and Technology, while building collaboration, organization, and higher level thinking skills. Tools like Edmodo, Evernote, Google Docs, Weebly, iMovie, Remind, LiveBinders, and Glogster can help your students create successful Genius Hour Projects. Students who learn to evaluate their own work become life-long learners. They begin to understand their own personal strengths and weaknesses and begin to see ways to become a self-advocate for optimum learning. Use these quick and easy forms and ideas for student self-assessment and informal formative assessment to gauge the learning taking place in your classroom. What can inspire students to want to learn? For some it is competition; for others, a chance to create. The Future Problem Solving Program offers both. This international program has several competition components that inspire students to investigate real world issues and to be innovative in using the creative problem solving process to extrapolate solutions for the future. See how FPS can be a basis for student service projects and problem based learning now encouraged in many school systems. How do you collaborate with regular education teachers and help meet the needs of the gifted learner every day of the week? In this session we will examine how one district uses the Collaborative and Cluster gifted program models to help challenge and grow our gifted learners everyday of the week followed by a round table discussion to share ideas. Gifted Resource is common at the elementary level, but Advanced Content is the reigning gifted service at middle schools. AC classes meet the academic needs of gifted learners, but additional needs such as social-emotional issues, creative expression, and the ability to focus on areas of interest, may never be addressed. This session will discuss how three innovative Cobb County middle schools have integrated these varied needs into an academically focused Gifted Resource Class. Get your creative juices flowing and have fun while learning some strategies that you can incorporate into your curriculum. We will have interactive stations around the room where you can experience strategies for developing creativity. Each station will also have information on the strategy as well as how the strategy may be used in different content areas and for different age groups. After 15 minutes, we will indicate that it is time to change, and you will rotate to another station. This bazaar of creativity strategies may result in some very bizarre sights, sounds, and products, but we hope you will enjoy yourself and get some great ideas for developing creativity in your students. If you want to engage your students in hands-on discovery based science activities but don’t have the equipment or materials then this is the session for you. We will explore 20 physical science experiments and demonstrations you can do in your classroom tomorrow using off the shelf products from your local Dollar Store. These activities will cover force & motion, chemical & physical changes, heat, electricity and magnetism. Participants will receive lab sheets and guides to conduct the activities in their own classrooms. Bring some excitement and wow factor to your science lessons with Dollar Store Science. In this interactive session, participants will view a digital photo story, created by a culturally and linguistically diverse (CLD) learner, and utilize the NOT-ICE protocol as a means for facilitating critical dialogue and reflection about the gifts and talents of CLD students that often remain obscured by language and cultural differences. Participants will learn how digital photo stories can be used as referral or assessment tools as well as how they can cultivate gifts and talents in the classroom. Teachers differentiate instruction for their students. We all agree, this is good. Do we provide opportunities for our teachers to differentiate their own professional learning? Now you can. GAGC now offers online professional learning by recognized experts in gifted education. Discover the innovative ways districts across the country are using GT Ignite to meet the unique needs of all of their GT and Gen Ed teachers. You will also learn how to get FREE access to the entire library of courses. Infusing the National History Day (NHD) program into any middle or high school gifted program allows students and teachers the opportunity for limitless learning. In this presentation, participants will not only have the opportunity to learn what the program is about and how it fits into state standards as well as gifted standards, but they will learn how to create a growth mindset portfolio to track the progress of their students. Click on each session title to view RAW data from networking session. Mathematically gifted students need to build a strong foundation in order to be prepared for advanced math work in later grades; to provide this foundation, teachers must integrate both the grade-level content standards and the standards for mathematical practice to provide in-depth investigations that develop critical thinking and creativity. In this session, participants will analyze and explore rich mathematical problems, questions, and activities that promote critical thinking and creativity. The presenter will share sample lessons and resources. My presentation will be on authentic technology integration for engagement of gifted and advanced level learners. We will look at ways to go beyond basic educational technologies and make the integration experience authentic to the more challenging education environment. We will focus on integration of technology with project based learning and how to guide students through the technologies and how to increase their engagement in each project. Almost four decades of working with gifted students in Duke TIP summer programs has provided evidence of the nature of the characteristics of gifted/talented students. While individual differences (and exceptions to the rule) abound, there are strong tendencies among gifted kids regarding their social and emotional development that can inform parents and teachers, helping them to understand the response they receive from their children and students. Awareness of these characteristics can turn the “rough seas” of interactions in school and in the home into “smooth sailing” for everyone involved. Students need a weekly dose of higher order thinking if they are to become better problem solvers. Provide your students with better materials and methods to spark their love of math. Fun, interactive science workshop that will offer engaging, hands-on experiments and activities to incorporate science and literacy. Be ready to laugh and possibly get messy! Learn what new things the creators of the Quirkles have in store for 2016! Gail Humble, GaDOE Gifted Program Specialist, will facilitate a discussion session on Gifted Education in Georgia – Where are we, how do we compare with other states and where are we headed in the future. Time will also be reserved for questions and answers from program coordinators/directors and teachers about gifted programs in Georgia. extensions appropriate for gifted students. The College Board strongly encourages educators to make equitable access a guiding principle for their AP Programs by giving all willing and academically prepared students the opportunity to participate. Learn about new resources that can be used to enhance a rigorous curriculum for all --such as AP Capstone, Khan Academy and AP Insight. You will be provided research and online tools to help students and families aspire, explore, choose, and enroll and succeed in AP and improve SAT performance. You will also identify and develop strategies appropriate for the culture of your school or district. With increasing globalization and development in the 21st century comes the demand to think creatively and innovatively. While it is clear that creativity is essential to success in today’s schools and workplaces, the demand to enhance creative skills is both nebulous and intimidating. This presentation illustrates how E. Paul Torrance’s Incubation Model of Teaching (IMT) can be easily used to effectively deliver content while simultaneously promoting creative thinking skills across diverse domains and contexts. Specific emphasis will be placed on the techniques used to “Keep the Learning Going,” extending beyond boundaries and establishing meaningful relationships between various contents and contexts. With a push for deeper learning through the incorporation of 21st-century skills, both PBL (project-based learning) and STEAM (science, technology, engineering, arts, and math) initiatives can provide opportunities for creativity and problem solving. In this hands-on learning session, participants will explore ways in which they can integrate the Engineering Design Process with real world problem scenarios to support student development of authentic products. Looking for a way to get your kids to research, write, speak, use technology, and learn your content while having fun doing it? If so, this session is for you. In this session, you will see students demonstrating their strategy for learning in a fun and unique way. This strategy can be adapted for all grade levels and content areas. You will leave this session with materials (instructions, handouts, and rubrics) that you can take back and easily implement on Monday! Carol Ann Tomlinson’s recommendations for differentiation are predicated upon recognizing student readiness, interests and learning preferences, including learning styles. This session will present a description of learning styles and the impact that individual differences can have on the instructional process. Participants will receive a brief overview of learning styles in general. Three major models will be considered – Dunn & Dunn, Myers-Briggs, and Gregorc – with the Gregorc conceptualization taking the dominant role in the presentation. The rationale for using the Gregorc approach to style can guide teachers in a practical approach to differentiate for their students. Understanding of style differences may also explain why your in-laws drive you crazy! Teachers will learn how one middle school teacher implemented a 20% time class (also called Genius Hour, Passion Projects, and Project-Based Learning) with gifted learners. Examples of student projects will be shared as well as a list of resources and ideas for implementing the program at any level. Gifted identification of a child should signal that more work is needed, but more shouldn’t mean quantity. Students who are gifted and talented crave depth, analysis, reflection, and creativity. We’ll show you how to challenge your students with fewer assignments (less grading for you) and more valuable activities (more challenge for them) to stimulate their thirst for knowledge, which is the real goal of education. This research-based presentation in interactive, so get ready to learn by doing! Research has shown that early childhood is the best time to recognize future promise in high-aptitude children. It is critical to focus on practices that provide high quality and engaging practices to help young children develop their talents. The session will focus on the challenges and benefits of talent development and identification of our primary grade learners. This interactive session introduces four easy-to-use lesson planning formats -- Questivities™, Encounter Lessons, Six Thinking Hats, and SCAMPER -- appropriate for enhancing creative and critical thinking. Each is based on the Common Core Standards and offers ways for students to answer a series of divergent thinking questions. These questions stimulate ‘outside-the-box’ thinking and provide a springboard for research and creative project activities. You will participate in lessons using two of the formats and will receive information on the other two. Picture Books are a popular resource to use when teaching new lessons. Did you know that picture books can also be influential in helping to nurture creative potential in children? Come along as we take a journey through picture books to discover innovative ways for encouraging new ideas and creative problem solving. We will explore ideas that can be put into use the very next day! This will surely be one for the books! We have facilitated a PL community within our county to highlight Gifted teacher's abilities. We highlight technology in the classroom, enriching the curriculum and how to make every classroom a gifted classroom! We will show you how to highlight the resources around you to enrich your standards and enhance your student engagement. We want to bring our 21st century learners, 21st century instructors. Assessment can be a creative adventure for our students! You can assess your students know by having them create digital products to demonstrate what they know and understand about a topic. We will explore a variety of free tools: Newspaper Clipping Generator, Fake Text, FakeBook, Chatterpix, Animoto, paper slide videos, green screen, original songs, and music videos. Learn how to turn your class into a team of problem-solving, risk-taking collaborators! Help your students develop critical thinking and creativity through experiential team building activities that can be used at any time during your school day. As you challenge them out of their comfort zones, your students will practice life skills like communication, problem-solving, cooperation, and compromising as they work as a team. Need to see this in action? Come on in and let's get started! Chess-related problems address complex spatial tasks and relationships, provide collaborative or competitive challenges, and allow students to intuit and explain reasoning. Championship Chess Director Stephen Schneider will demonstrate how chess can provide puzzles and problems that will focus on deductive/inductive reasoning, spatial awareness and visualization and enhance cognitive outcomes. Kids ask tons of questions each day! But what is the quality of their questioning? Will the answers to their questions keep them floating on the surface or entice them to dive deeper? Asking valuable questions and inspiring curiosity is key to an innovative future. Inquiry-based learning can develop questioning skills and engage students. This session will provide practical and easy ideas to incorporate inquiry into your lessons, even in classrooms that are rushed for time or bound by curriculum. Are you interested in beginning a Community Problem Solving team at your middle school but aren't sure where to start? Coach Laura Gary from Renfroe Middle and Coach Michelle Vecchio-Weinmeister from Clarke Middle are eager to share with you what they are learning, through trial and error, to help you build your own CmPS program. Items addressed will include: Gaining Administration Support | Team Formation | Team Building Strategies Geared Toward Adolescents |Timeline Management to Reach Competition Goals | Fundraising Ideas | Team Communication |Establishing Team Roles | Supporting Team Research Without Taking Over. This workshop will review great tools for building an extraordinary elementary gifted classroom as well as share a few new tools for your toolbox.. Not your ordinary tools...but we will present a variety of tools to enhance the use of technology, communication, collaboration, creative and critical thinking, and problem solving. Some tools included are: STEM, Lego Engineering, Interdisciplinary Units, engaging web tools, research methods, CPS, and much more. Join us in filling your "Gifted Teacher Toolbox". Curriculum flipping is an under-utilized way of offering students a differentiated classroom. We can flip our classes to offer support students need at home while freeing up class time to offer extension and enrichment through differentiated activities. Students can acquire new content and enter the class setting ready to engage in activities differentiated for content, process or product according to student interests, learning profiles and readiness levels. The marriage of these two instructional approaches will change your teaching...till death do they part. At the institutional level, a primary focus has been on embedding civic engagement in teaching, research, and service on campus (Furco, 2010). With universities emphasizing the value of community involvement and voluntary community service, this commitment begins to create a culture of service and civic engagement on both the campus and within the community. This study addresses the how a service-learning First-Year Seminar affects gifted university students’ current level of engagement. This session will provide results from the study, as well as insights on how university professionals and schools can provide experiences for undergraduate and K-12 students that will impact their future engagement in the community and the university. Learn how to plan a Problem Based Learning Unit that is current, relevant, and direct from the headlines. Session participants will learn how to select a real world problem, identify content objectives to interweave within the context, and plan the unit for student achievement, engagement and success. Session participants will: 1) learn how to successfully select a relevant problem scenario based on current real world events; 2) explore how to incorporate content standards and objectives within the problem scenario; 3) investigate how to design and implement activities supporting the unit; and 4) learn how to assess a problem-based unit requiring students to think critically and analytically. Many times teachers of the gifted have the extra responsibility of coordinating the student news show with their students. In this session, tips, advice, and a few internet tools will be shared that can help make the news more interesting and capitalize on the students' creativity. These tools can be expanded beyond the student news for student project creation! What is a MakerSpace? Easy, it's a space where students can make things. Our MakerSpace is a "STEMist" MakerSpace where students work with the STEM concepts to show their innovation and creativity. In this session you will be immersed in ideas of how to implement a MakerSpace at your school and how to get students involved in activities that enhance their knowledge of Science, Technology, Engineering, and Mathematics. Parents are the first educators of children. Now, more than ever, parents are looking for better ways to bring balance to their hectic pace of life and provide more academic support and critical thinking opportunities in the home. Discover hidden opportunities for maximizing your teaching time and integrating “smart play” teaching and learning techniques. In this hands-on workshop, the presenter will engage participants in interdisciplinary activities that help students explore human impacts on the planet including population growth, rising global temperature, threats to biodiversity, and compromised ecosystems. The presented activities build skills in science, math and social sciences, while applying learning to authentic problems. Activity formats include graphing and data analysis, modeling, and group problem-solving. Participants will receive lesson plans and background readings on CD-ROM matched to state standards. This presentation underscores the importance of developmental processes needed to support underrepresented populations of giftedness. Educators will learn strategies designed to counteract deficit thinking about socioeconomic and cultural differences that create landmine barriers to identification and talent development of underrepresented gifted children. After this session, educators will appreciate the need to develop talent first and identify later to minimize barriers to identification. Developing talent first emphasizes strategies that foster critical thinking and problem-solving skills in underrepresented populations of gifted children. The session will be packed with essential tools and strategies for implementing Mobile Applications in the classroom with exceptional children. Learn ways to support students collaborate, communicate and build a cohesive community by using Mobile Applications. Utilizing the work of Sandra Kaplan (icons for depth and complexity) and Carol Tomlinson (differentiation), this session will illustrate specific instruction that leads a gifted learner to a rigorous learning experience. We will discuss and consider connections between differentiation and rigor and will be able to implement these ideas in a gifted class OR in a mixed-ability setting with equal success. Join Legislative Liaison Laurie Ecke in a discussion about the current issues impacting gifted education. The “Every Student Succeeds Act,” Georgia’s Education Reform Commission, the 2016 Georgia Legislative Session, and other important issues combine to create a significant time of decision making at the national, state, and local level. Become informed about key policies and how GAGC members can advocate for our gifted and talented students to have opportunities to reach their potential. Creative thinking and the ability to use creativity in problem solving are important 21st century skills, but many teachers are uncertain of how to integrate creativity into the curriculum. Creative thinking skills such as creative problem solving, synectics, and SCAMPER can be infused into differentiated instruction to help teachers meet the academic and affective needs of gifted students. The presenters will focus on incorporating practical and fun creative strategies into content areas and share sample lessons and resources. © 2007 - 2014 Georgia Association for Gifted Children. All Rights Reserved. Join our Group on Facebook! Follow Us!